This 13 unit apartment building is on prestigious State St in the Village of Seneca Falls. It was built as a modern primary school in 1905 in the “fresh air” period. The substantial brick three floor building is located with the Historic District and Heritage Area in the Village of Seneca Falls. The building was converted from school use to apartments in 1992. The apartments make use of the original large spacious classrooms and large windows to create spacious elegant dwelling units with modern mechanical and energy efficient living. The building is a secure environment with an entry access system that calls the tenant upon arrival of their guest and allows keypad access to the common areas for residents. An elevator services the building allowing tenants easy access to all dwelling units. There is off street assigned parking for each resident. 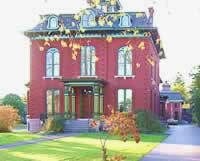 The building is located adjacent to the Seneca Falls Library and a short walk to all village services. Each apartment features tall ceilings, central air, in-unit washers & dryers, and is pre-wired for phone and cable in every room. The apartments range in square footage from 750 square feet to over 1,200 square feet. One bedroom one bath units rent from $850 plus utilities, two bedroom two bath units rent from $995 plus utilities, and premium two bedrooms rent from $1,100 plus utilities.